Human Physiology seeks to understand the mechanisms that work to keep the human body alive and functioning. It forms the pillar of Modern Medicine. A disease is an expression of functional disharmony of the physiological functions due to prolonged disturbances of any kind. Understanding the nature of disturbance is critical to comprehend the pathophysiology of a disease and the physiological basis of management of the disease. Much of the foundation of knowledge in Human Physiology was provided by animal experimentation. Due to the frequent connection between form and function, Physiology and Anatomy are intrinsically linked and are studied in tandem as part of a medical curriculum. Physiology is the core subject of Medical Research. Therefore, from its inception in 1901, the Nobel Prize in the field of Medical Sciences has been designated as “Nobel prize in Physiology” or “Physiology and Medicine “. Therefore, to learn any branch of medicine, it is essential to acquire the basic knowledge of systemic physiology related to the speciality. The concept in Physiology helps to understand, diagnose and treat the disease. The great Physiologist E. H. Starling had said “Physiology of today is the Medicine for tomorrow.” A practitioner should have basic knowledge of Physiology to become a good Physician. Also, a Physiologist by virtue of his knowledge is inherently a good Physician. So, a good Physician is a good Physiologist and a good Physiologist is a good Physician. 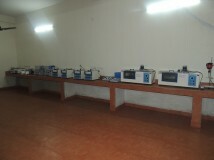 There are adequate microscopes, hemocytometers, hemoglobinometers, etc where the students will be given a hands on training to perform the preliminary blood tests like Total count of RBCs, WBCs, Platelets, Differential Count of WBCs , Hemoglobin estimation, Blood grouping, Bleeding time, Clotting time, E.S.R. It is equipped with examination tables and clinical instruments like stethoscopes, sphygmomanometers, percussion hammers, tuning forks, etc. It will be a breath-taking experience for the budding doctors as here they will be taught the preliminary methods of examination of patients and they will be thrilled to learn how to use the stethoscope for the first time here in this laboratory. It will include a detailed examination of the Cardiovascular System, Respiratory System and Nervous System. This lab has instruments to record the muscle contraction of muscles of frog and also record the contraction of the heart of frog or toad. These include the Kymograph, Myograph board and stand, Stimulators etc. Here experiments on mammalian intestine will be demonstrated to the students so that they can learn about the motility of the human intestine which mimics that of the rat or guineapig. The instruments are Dale’s Bath, Kymograph, etc. Though this is basically for the Post-graduate students, the UG students will also find it useful as they will learn Spirometry, Perimetry and Stethography over here. For the PG research we have Physiographs which are used to record different parameters like pulse, EEG, EMG, HRV, NCV etc. They will be utilised to conduct tutorial classes. Here small group teaching will be implemented so that students can clear their doubts from a close quarter. There is a departmental library with Medical books as prescribed by MCI and the room can also be used for Faculty Seminar and PG seminar in the near future. The most valuable resource of our department is the Academic staff, consisting of a highly versatile and dedicated team of faculty members. The department is already conducting classes for Paramedical Course like Dialysis Technician Course. For the MBBS students, in addition to the Lecture classes, Practical classes and Tutorial Classes the students will be regularly evaluated by weekly assessments in the form of oral, practical and written tests. In addition there will be two Semester Examinations as per WBUHS rules.